Brilliant colors, smart prices! Top-quality glass stain at a budget price. Safe and non-toxic, this best selling assortment of our 10 most popular colors will bring your stained glass projects to life! Precision tip squeeze tubes are a handy way to dispense glass stain for your latest sun catcher project. 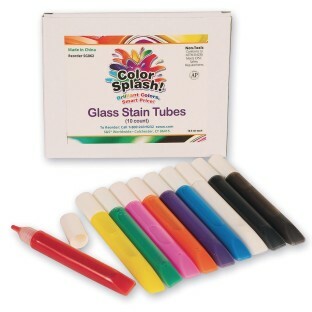 Includes bold, transparent colors: red, yellow, blue, green, orange, purple, pink, black, brown, and white. Do not shake before use to avoid bubbles. 10.5ml per tube. Protect skin, clothing, and work surfaces as this concentrate color may stain.